This is how Sham came into the world, far away from Aleppo – her parents and her three older siblings’ hometown. Sham was born in Istanbul in 2014, almost two years after her family had fled Syria, her mother told Middle East Eye. Muhammet named her baby after Syria’s capital, Damascus – Sham in Arabic and Turkish – a city the Syrian born in Turkey may never see. Sham is one of 385,431 babies born to Syrian parents in Turkey between April 2011 and November 2018, according to official statistics – representing roughly as many children as the total number of inhabitants of the Italian city of Florence. 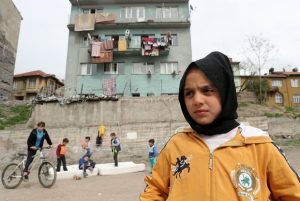 Sham was born stateless, like the vast majority of Syrian children in Turkey. She and her family have now had Turkish citizenship for a year and a half, but they are an exception to the rule. Of the 3.5 million Syrians in Turkey, only around 59,000 – less than 2 percent – have been naturalised in the last seven years. The existence of children like Sham “can be read as a sign of [Syrians in Turkey’s] inclination to stay permanently,” the Turkish Ombudsman Institution underlined in its recent “Special Report on Syrians in Turkey”. “If Syrian society and Turkish society are not adequately prepared for the possibility of Syrians staying in Turkey permanently, this situation could lead to several serious problems,” the report read, warning that integration policies could increase the “risk” of Syrians staying in the country. In an address to parliament on 15 November, Turkish Interior Minister Suleyman Soylu addressed the importance of embracing children such as Sham. “If the country decides to give citizenship to all of these [Syrian] children, tomorrow, when they return to their country with all their experiences here and with their crescent and star [Turkish] passport, they can talk about what brotherhood means to this country, this geography,” he said. For the time being, there has been no attempt by the government to grant citizenship to Turkey-born Syrian babies on a large scale. However, this has not stopped a torrent of fake news on the subject, particularly on social media. A Twitter post in September claimed that, in the previous six months, 225,000 Syrians had given birth in Turkey. “Turks must wake up,” the tweet added. The post received thousands of likes and over 1,300 retweets. Official figures suggest a birth rate closer to 50-55,000 a year – less than a quarter of the number given by the scaremongering tweet. A similar fake news item was shared more than 4,000 times on Facebook, according to Teyit, a fact-checking organisation in Turkey dedicated to preventing false information from spreading on the Internet. Another similar hoax became so widespread that authorities in the Turkish border city of Hatay were forced to release an official statement dispelling the rumour that Syrian children born in Turkey were all becoming citizens. Turkey is not among the countries that applies jus soli – in which citizenship is automatically granted to babies born in a nation’s territory. Rather, it generally grants citizenship on the basis of the parents’ nationality, otherwise known as jus sanguinis. Turkish law stipulates that “a child born in Turkey, but acquiring no citizenship from his or her foreign mother or foreign father, acquires Turkish citizenship by birth”. Syrian refugees in Turkey are given the status of “foreigners under temporary protection” – in other words, they are not officially considered refugees. As is frequently underlined by politicians, they have an unofficial status: “Syrian guests”. Thus, babies born to Syrian parents are Syrian citizens, according to Turkey, and the ID cards issued to them by Turkey state that they are Syrians. However, there is a problem: the Syrian state is not aware of its newborn citizens, for a variety of reasons. Umm Amir, a mother of four who requested not to be identified by her full name, showed MEE a small official booklet issued by Syrian authorities. She keeps it in a plastic sleeve and treats it with the care one would expect for a precious document. She, her husband and their first three children are listed in this booklet, which is a vital document in Syria. But her youngest child, four-year-old Amir, who was born in Turkey just two months after the family fled Syria, is not in there. “At the consulate they ask for huge amounts of money, which we don’t have,” Umm Amir said. From the same plastic sleeve she withdrew another document, this one from Turkish authorities, with Amir’s picture on it. When they were registered as a family upon their arrival in Turkey, Umm Amir, her husband and children were given a “family number”. These ID numbers are used on all Turkish-issued Syrian IDs and are identical for members of the same family. However, Amir was assigned a different family number than the rest of the family. His mother was worried. “We wanted to correct it, but Turkish authorities asked us for documents that we could not provide,” she said. Milhem’s mother faced a similar problem. She wanted to register her son on the family certificate issued by Turkish authorities, as her and her husband married in Turkey. Hodeifa applied to the Turkish authorities to record Milhem on this certificate, but she was told that it was not possible because they were not Turkish. The mothers of Milhem, Amir and Sham all agreed that, although they faced problems navigating the complex and often-changing Turkish bureaucracy designed to manage the country’s more than 3.5 million Syrian refugees, once their children were in the system they were treated very well. Health services for children are free; their vaccination programme is closely monitored. The mothers of Syria-born babies, however, have other concerns: how will their children manage in Turkish society? In Turkey preschool is not compulsory. School starts at age six, is mandatory for 12 years and does not take nationality into account. Even children without any official papers have the right to attend school under Turkish law. But in practice, this is not always the case. Sham’s older siblings have been in and out of school over the years, but are all now receiving an education. However, Amir’s two older sisters and brother have dropped out. “They were not able to understand the teacher,” their mother explained, underlying the significance of the language barrier. Both Amir and Sham attend Syrian kindergartens. 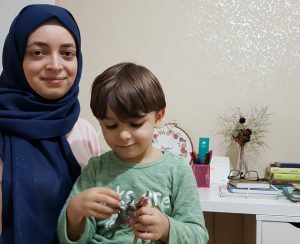 Their mothers stressed that they want their children to learn Arabic first, worrying that if they attended a Turkish preschool this would not be possible. “The older children have already forgotten many words in Arabic. It is important that they should not forget their language,” Muhammet, Sham’s mother, said. Hodeifa had a similar view, and was considering homeschooling her son Milhem in the future. However, she is also trying to teach him Turkish, speaking to him in the language with the help of her sister, who studies Turkish in college. “I want my son to learn Arabic from me, and Turkish from my sister, to make him learn both of the languages well,” she said. Muhammet works for an association tackling Syrian child labour. She knows lots of Syrian children and says that they can sometimes be left out in the classroom, sitting alone because their classmates do not want to interact with them. “They [Turkish children] are learning this from their parents; children themselves do not have prejudiced attitudes,” she explained. Hodeifa feared her son may face discrimination if he goes to school – not only from classmates, but from an impatient teacher. She added that if her family obtained Turkish citizenship, they may change their surname to a Turkish one to minimise possible bullying. Umm Amir echoed the other mothers’ fears. “Even if he was born in Turkey, even if he gets citizenship, they will call him Syrian and will discriminate against him,” she said. She added that even if Amir became a citizen, which she doubted was likely, she still wanted to return to Syria because life was easier there – but she noted that she was the only person in her family who felt that way, as all the others want to stay. All three mothers who spoke with MEE said they believed that children like theirs would become bridges between Turkish and Syrian societies. “I will be more motivated to integrate into Turkish society when Milhem starts to make Turkish friends. And in time I will communicate with his friends’ parents,” Hodeifa said, adding that she would encourage her son to socialise within Turkish society. When asked whether they would accept their child marrying a Turk, Hodeifa said yes – as did Muhammet, provided the Turk was a good person. But Umm Amir had a concern. Will there be a Turkish family that will willingly let their daughter marry a Syrian? The Turkish Ombudsman Institution, which forecast that children like Sham, Milhem, and Amir were in Turkey to stay, also suggested that Syrians of all ages should be taught Turkish, that state institutions should be able to supply services in Arabic online, and that a ministry dealing only with policies regarding the “Syrian guests” be established. “Turkey’s policies regarding Syrians have naturally been built on the concept of impermanence since the beginning. Terms such as temporary protection status, temporary accommodation centres, temporary identity cards, and temporary training centres are the products of this approach,” the ombudsman report read. When asked how their children should define themselves when they grow up, the three Syrian mothers all seemed to point in this direction. “Turk,” said Muhammet of her daughter Sham without hesitation. “Turkish with Syrian roots,” answered Hodeifa, Milhem’s mother, after thinking for a few seconds. This article was originally published by MEE.